Not to get too sentimental, but sometimes it is important to take a step back and admire all the wonderful things about life. Whether it’s family, friends, trips, pets, health or living down the block from your favorite coffee shop, we can all find something in life to be grateful for. The SLM team has a lot to be thankful for this year. We have been able to attend some amazing concerts and talk to some incredible musicians. Anyone who claims “music isn’t as good as it used to be” just hasn’t been looking in the right places – we’re grateful to be able to find new music we’re excited to share with our friends and readers every week. One of the experiences we’re thankful for every year continues to be Bumbershoot. Hopefully you took us up on some of our recommended performances for Day 1, Day 2 and Day 3, and even more importantly, hopefully you were glad you did. Here’s to another great Bumbershoot at Seattle Center this past September and some of the scenes we love looking back on from the festival. Adapting to festival life isn’t so hard. Our brains have already adjusted to thinking, “Oh, this is our life now. We rush around Seattle Center all day listening to amazing music. I guess we live here now.” But alas, silly brains. That is not the case. For today is the final day of Bumbershoot (queue gentle weeping and cries of “NOOOOO!!!”). Maybe we should save the weeping for tomorrow morning when it’s back to work and “normal” life, whatever that is. So for now, let’s rejoice and revel in the fact that today boasts another amazing lineup of music! Hurrah! Sweet vocals over strong surf undertones from the Emerald City. Country-tinged rock with a PacNW twist. Hometown, female-fronted ethereal retro-rock that keeps it sludgy yet buoyant. Atmospheric and echoy Iceland-inspired melodies from a Brooklyn-based vocalist. Knee-slapping Appalachian mountain music from a Puerto Rican virtuoso. Legendary Brooklyn indie-rockers with a penchant for intertwining the highs and lows of life. Cinematic, psychedelic indie-pop from a young, Dutch 60’s enthusiast. Pleasantly hazy surf-tinged indie-rock from the Garden State. 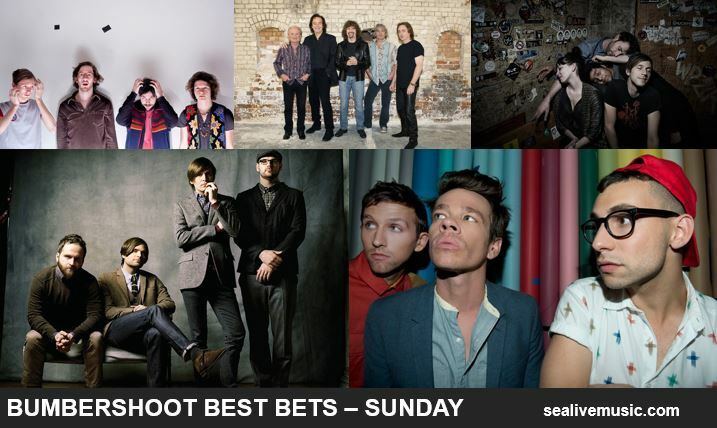 Music festivals never fail to schedule at least two great bands at the same time, and Bumbershoot 2014 is no different. We’re here to help you make the inevitable tough decisions to make sure you catch the best sets of the day. Mac DeMarco, a Montreal-based indie pop multi-instrumentalist, is a strong contender for your time. His latest single, “Salad Days,” feels like an easy-going summer jam that is somewhat reminiscent of Otis Redding’s “Sitting on the Dock of the Bay” with sadder lyrics. His songs teeter and amble, occasionally stumbling into unexpected key changes that keep his music intriguing. Certainly feel-good and fun to listen to, DeMarco is an ideal summer festival act to put on stage. However, we give the edge to Seattle’s own Iska Dhaaf for this face-off. While their music is darker and more complex, they have a distinct surf-rock undertone that keeps the music dance-able and somewhat hypnotic. The retro-inspired guitarwork paired with compelling time signatures and a tinge of sorrowful desperation in the lyrics provides a magnetic, modern sound that is entirely its own. Don’t get us wrong, both sets will be great. You really can’t go wrong. See you out there (in the rain)! If you’re anything like us, you’ve been pouring over the official Bumbershoot lineup with multi-colored pens and developing a hefty piecemeal schedule for each day. Or maybe that’s just us. Cumulus – 3:00 PM, Pavilion Stage. Poppy female-fronted rock with snappy drums and driving guitar riffs. A final farewell performance from the Anacortes indie darlings. Locally sourced folk-tinged songs infused with clever wordplay and a strong dose of pop sensibilities. After a much lauded debut to the Seattle scene, Ben Verdoes and Nathan Quiroga drive a raw, dark brand of surf-tinged rock. England’s pub rock legend helps the Bumber-crowd “pump it up” with catchy melodies and engaging lyrics. Hip hop master of Common Market fame will surely play some new tracks from his latest album released earlier this year. Wu Tang returns to Bumbershoot, featuring a collective of hip hop heavy hitters. Another Bumbershoot has come and gone, but that doesn’t mean we aren’t still relishing the great music we enjoyed with the masses all weekend. Another day, another Bumbershoot post! Bumbershoot has long been our favorite in-city music fest, hailing the end of a beautiful summer, and the beginning of autumn tour season. Today’s lineup is likely the best of the week with some hidden gems and billboard favorites side by side. If you missed Day 1, never fear – we’ll be tweeting + Facebooking from Seattle Center and next week your SEA live Music team will be posting a recap of some of the highlights from the weekend. 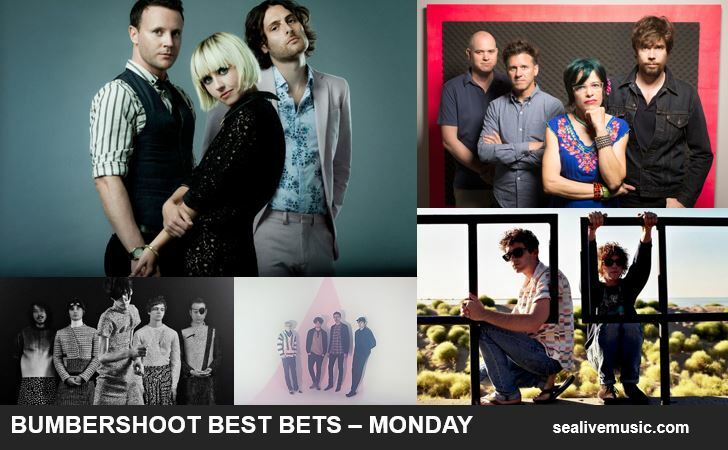 But in the meantime, without further ado, here’s our top picks for the middle day of Bumbershoot!